When it comes to dial, I always find Seiko quite successful manufacturing beautiful and nicely detailed dials irrespectively of the price range. 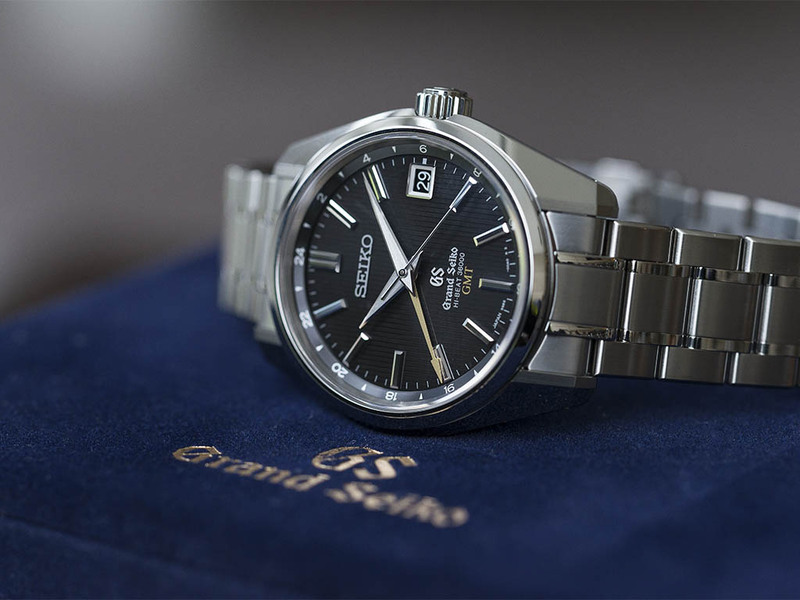 For Grand Seiko, the standards got even higher. One can easily grant the precisely detailed dial within the first seconds after seeing the watch in person. Beautifully decorated with vertical lines the dial features an anthracite tone for color.The hour hand and the second hand are designed in sword hand form with a touch of retro mood which happens to match with the stick indexes perfectly.Seiko chose a slightly thinner form for the second hand and GMT hand which presents a nice blend with the rest of the dial while offering enough difference in looks to read the GMT function efficiently. The date function is located at 3 o'clock position. Bearing a silver frame the date disk is printed in white fonts over black back ground which meets my “ date window NOT contrasting the dial “ criteria flawlessly. My personal thanks goes directly to Grand Seiko studios. 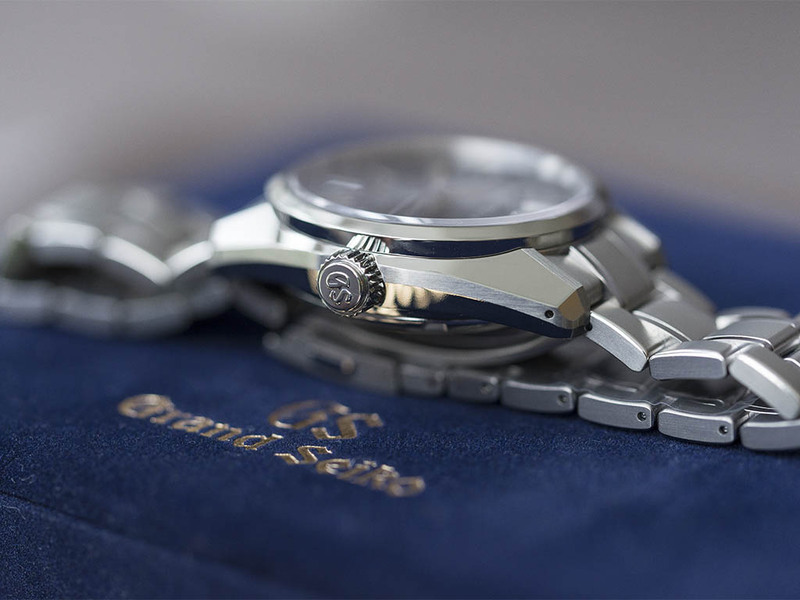 The Hi Beat 36000 and GMT writings located just below the Grand Seiko logo points the important assets of the watch with in style keeping the dial's simple but elegance design all together. The stainless steel case measures 40mm diameter. I would like to mention the finishing of the watch briefly. The polished surfaces feel and look like as if the watch is made of crystal instead of metal.It reminds me of some special models of Rado and Movado made of Tungsten. I spent minutes over the watch with a magnifier in my hand in search of an imperfection on the case's finish but ended up finding nothing. The polished and slightly domed bezel surrounds the crystal made of sapphire and treated with anti reflective coating. See through case back allows the user to watch the beautifully finished caliber. The watch comes with WR100M rating which is suitable for average daily user. 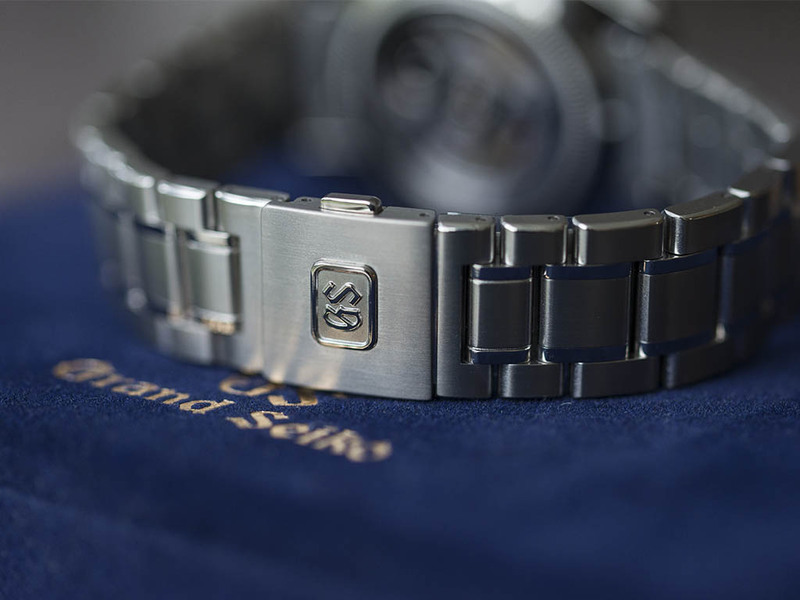 Stainless steel bracelet which looks a bit simple at the first glance actually features a flawless presence matching with the rest of the watch.The links that generate the watch is curved at the edges thus preventing the links to scratch each other upon contact while boosting up the wearing comfort. By using the polished parts in minimum Seiko achieved optimum blend ratio for polish vs satin finish design wise while helping the bracelet keep it's fresh look by minimizing the polished area of the parts which are prone to scratching. Double side push release type clasp works like a charm and suits the watch fine as wine. 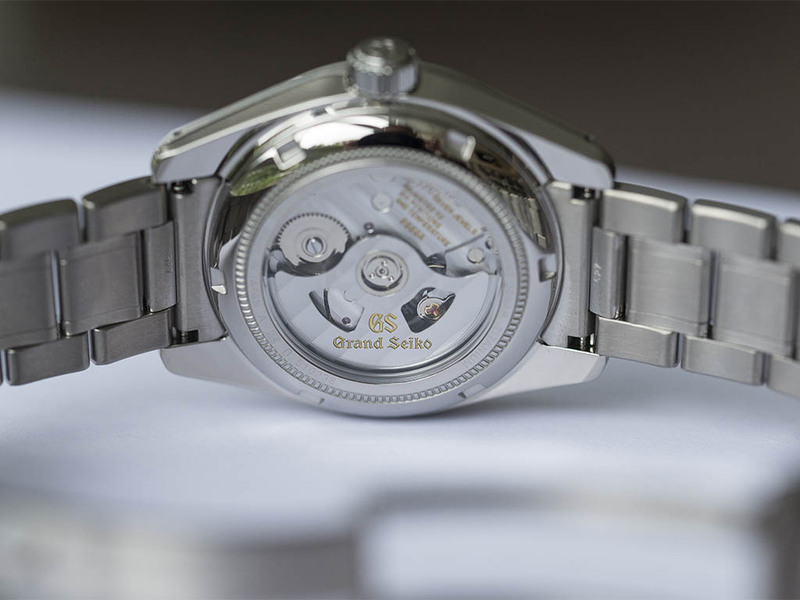 Grand Seiko Hi Beat GMT is powered by a GMT module added version ( Ref. 9S86 ) of the Seiko caliber Ref. 9S85 first launched at 2009. The caliber which ticks at 36000vph is also the first Hi-Beat caliber out of Seiko with GMT function. Beating the COSC standards with an -/+1scn difference at -3scn to +5scn per day accuracy the mechanical perfection of the caliber Ref. 9S86 is celebrated with precisely decorated parts as well. Perforated rotor allows the user to see the stunningly finished parts through the windows revealing the utmost perfection achieved with the details. The bridges have vertical lines which reminds me of Glashütte's style but slightly differentiate with the thickness of the lines. I must admit that I liked the watch. A lot..
All my major criteria such design, precision, wrist presence, comfort and perfection are well satisfied with this marvelous Grand Seiko. Personally I am having hard time to mention a negative side for the watch. 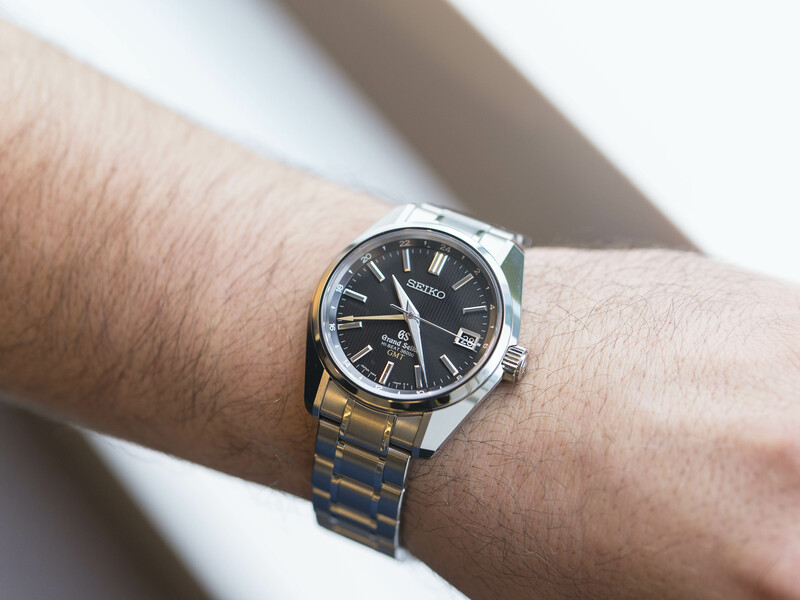 Only one thing - which is as biased as it can get – The price tag.As a permanent subject for fierce discussions among the watch aficionados, the price policy of the Grand Seiko product line gets different critics. 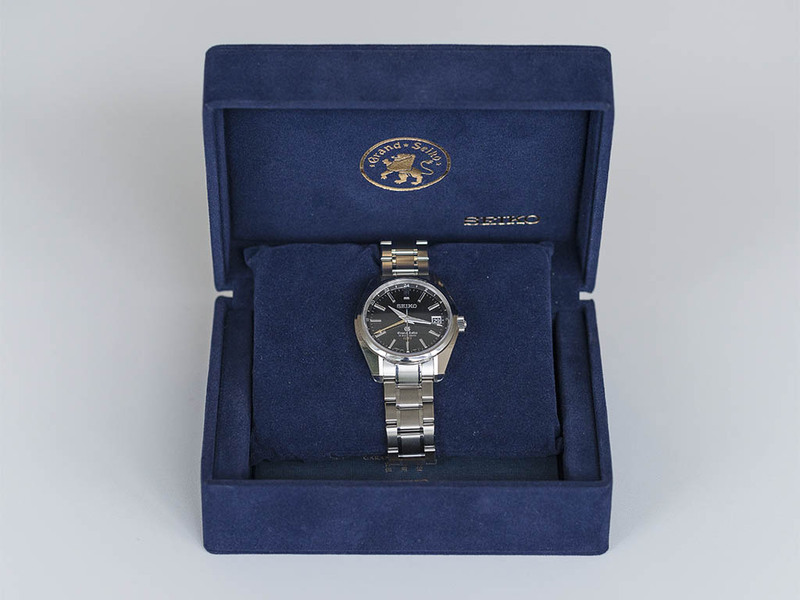 As a matter of fact, Seiko is a well known and highly praised brand via it's highest ranking products for price/performance ratings.However, the asking prices for the product group can effortlessly battle with Swiss brands which became synonyms with the Prestige criteria. 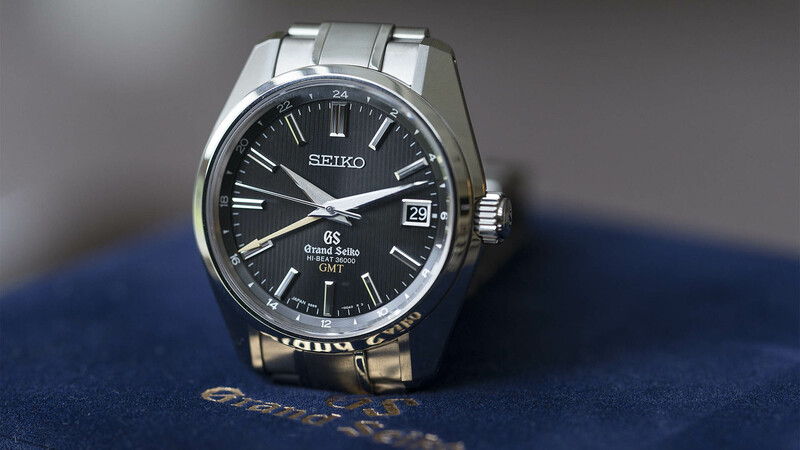 If you are in to simple but elegant designs and you want GMT function in your watch, Grand Seiko Hi Beat GMT should definitely be in the shopping list. If you require precision, unique design and rarity above the initially listed specs, than this beautiful time piece presenting the Japanese philosophy in every single detail is a spot on for you.